Sad part is he had to fight off using the word ‘terrific’, finally settling on the word ‘good’. 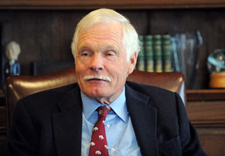 During an appearance on Piers Morgan Tonight, Ted Turner said he thinks it’s “good” that U.S. soldiers are killing themselves because it shows humanity has evolved a distaste for war. Some have argued that Turner is expressing his satisfaction at U.S. troops killing themselves because it indicates that humanity is starting to spiritually evolve an aversion to war.